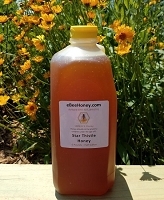 Raw Clover Honey in a 1 gallon container which is 12 pounds of honey. Raw clover honey is starting to crystallize now. Please note we may use a wide mouth or narrow mouth container with raw honey. We start to use wide mouth containers as the honey starts to crystallize. All honey starts out in a liquid state and over time will start to crystallize - turn from a liquid to a solid. Raw honey crystallizes quicker than honey that's been heated and filtered. The 2 pictures above show raw clover honey - one in the liquid state and one in the crystallized state. Raw clover honey in a 1 gallon container which is 12 pounds of honey. Raw honey has not been heated and simply filtered through a large mesh screen. The screen removes larger particles and allows pollen, propolis and beeswax particles to pass through it. Clover honey has a pleasing, mild taste. 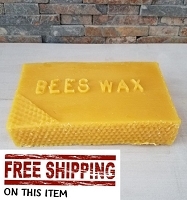 I have been ordering from ebeehoney for about 1 and 1/2 years, and their quality is above and beyond.Shipping is always quick. 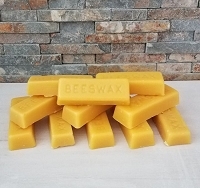 Delicious raw honey, perfect natural sweetener. This is my second large order from ebeehoney which I have used to make mead. I also used some for drinking tea and realized how much better this stuff is as compared to those little bears in the grocery store. Ordered and received within two days. Great honey! Tasted delicious and shipped quickly. It'll make a fine mead! WOW!! I think this clover honey is amazing!! It was crystalized,but that does not matter! 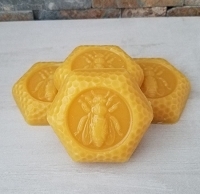 Ebeehoney crystalized is not in huge crystals at all.It is very small crystals,closer to a creamed consistency. I think every raw honey I have bought from your company is amazing.You definitely have bees with skills at finding the best pollen to produce the best raw honey!! You cannot go wrong with a single variety of ebeee raw honey!! O my goodness!! Buy Buy Buy this sweet goodness!! Your bees produce some of the best raw honey I have ever had!!! Thank you! Thank you ! Thank you! This clover honey is delicious! It paired nicely with the munich malt I'm using to brew a braggot. I have high hopes for the finished product, as the honey is great. The jugs were well packed in their parcel as well. Great stuff. Ebeehoney raw wild flower honey and raw clover honey both of them have terrific taste , thickness and best quality. Shipping is extremely fast. 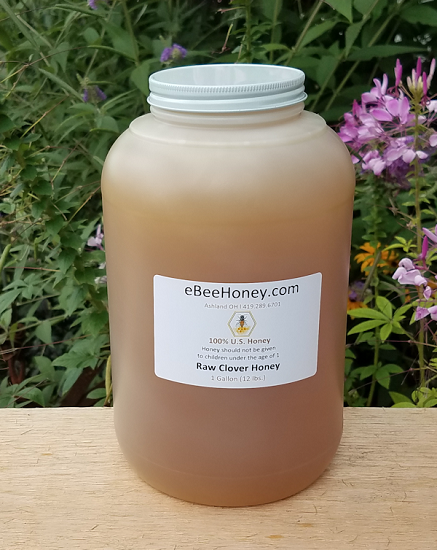 We've been buying gallons raw wild flower honey and raw clover honey for years we are very satisfied.Love your honey very much .Your bees providing us amazing honeys.Thank you for the great product and great service . 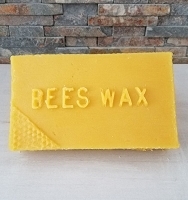 I have been using eBeeHoney for several years. This honey is absolutely delicious and I can definitely tell the difference between it and some other companies. We are in a honey crisis right now, bees are dying, pesticide use is up, and fake honey is diluting the pure honey market. Rest assured that this honey is prime. You can taste and smell the difference. And shipping is so fast it's scary. I love love love this company and their honey products. This honey is exactly what I have been looking for. I must say I have never, EVER tasted honey like this honey. Everything else is just honey. This honey was made by heavenly bees! No exaggeration. I don't usually go nuts over products, but had no problem doing it with this product. You must be giving your bees a lot of love. I'm the only one eating it and a quarter of the jug is already gone. I won't even consider buying honey anywhere else after tasting this. Can't thank you enough for a great experience in dealing with you as well as the product. I hope I will always be able to get it. This honey is delicious! I've tried many brands of raw honey since it's all I use for baking and sweetening. This clover honey is tasty and truly raw. Price is good and shipping was very fast. I try to buy local honey but I'm not able to find it in bulk locally. This is where I'll be buying my honey from now on! The eBeeHoney products have provided our basis for raw honey consumption for years. The products are excellent and reasonably priced, even with the shipping charges. We always keep a good quantity on hand. Excellent value. Best honey for cooking, baking, or just eating!!! Love it!!! If you like clover honey then this is a real treat. This is right at the top of the best clover honey I have ever had, so buy it and you will be very happy with your purchase. And so far both times I have been very pleased. The first order was for a 5 pound container and I was back this time for a 12 pound container. I use it in my coffee every morning and I drink several cups so I use a fair bit. Very light and mild and delightful honey. Unless I can find as good a product locally somewhere, I'll continue to tolerate the cost of shipping just to get this great honey! Excellent honey - brings back memories of my childhood and cups of honey-sweetened tea. This is the best honey I've ever had! You can't beat it and it was delivered really fast! Hi, Been using Raw Clover honey in my wheat bread recipe and have had nothing but raves about it since we switched from store bought. Our orders get larger each time, we love it! This Clover Honey is one of my favorites. But who can choose its honey they're all awesome. 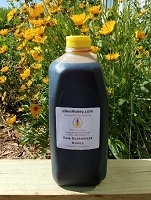 We have ordered raw honey many times, in several varieties, from e Bee Honey. All of their products are fantastic and (for the quality) a bargain. 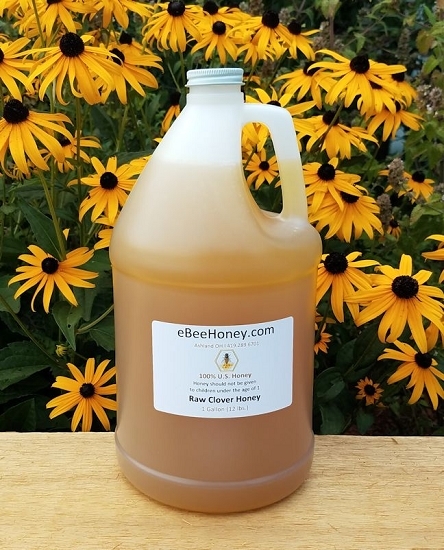 This clover honey is one of our favorites. You can't go wrong. It's a good, all-around honey with a flavor that complements anything. Great flavor and we presume the harvest must come from the local area. The honey does crystalize over time so prior to drawing some from the container, it's helpful to store the honey in a warm location to improve its viscosity. If you are interested in a healthful syrup, you may construct your own with a one-to-one proportion of lemon juice and honey. Heat and stir prior to use. You'll get hooked on it. This formula also works well for sore throats, very soothing, just be sure it has "warmed down" prior to use. This is excellent honey. We keep re-ordering. We use it mostly for good Enlish tea. Shipping is always super fast.